The HP Pavilion Mini 300. HP's Pavilion Mini 300-20 is a surprisingly great value for anyone who wants to get a small computer system to add to a home theater system. Its small size lets it be installed just about anywhere and the included wireless mouse and keyboard lets you use it when its locked into a cabinet. Of course, it could always be used as a stand-alone desktop computer system as well. 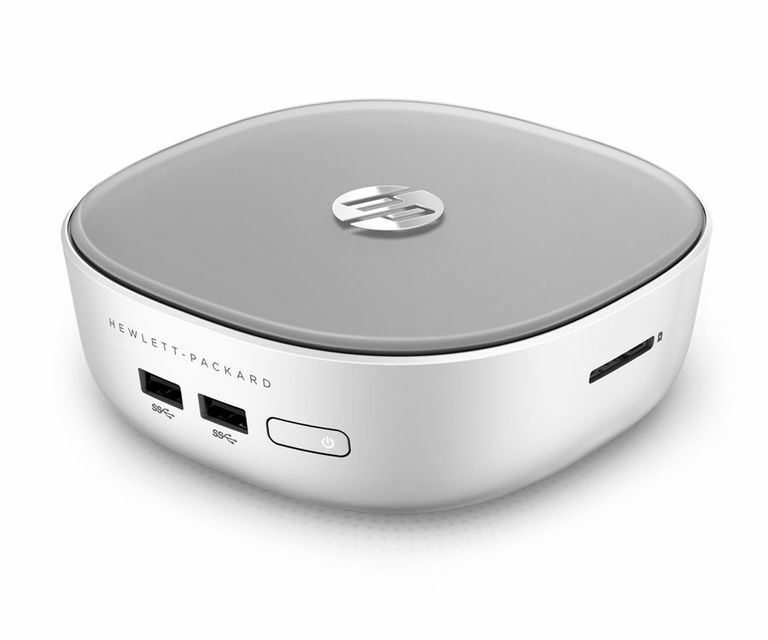 HP announced its two low-cost mini-PC options earlier in the year. The Stream Mini was to be the extremely low-cost option for those that just wanted to get connected while the more expensive Pavilion Mini 300 offed more performance and features for additional tasks. Both have the same small footprint that is smaller than an Apple Mac Mini but taller than its slim counterpart. Overall, the design is nice and can fit just about anywhere. There are several different versions of the HP Pavilion Small with the 300-20 being the most affordable of the retail versions. It features an Intel Pentium 3558 dual-core mobile processor that offers more than enough performance for someone looking to use this as a connected computer for browsing the web, streaming media or even productivity software. It is not going to be a strong multitasking system or for higher-end applications both because of the processor and the 4GB of DDR3 memory the processor is matched up with. It often seems to be quite slow when moving between applications. Thankfully, the memory can be upgraded through a bit of work. Storage on the HP Pavilion Small 300-20 is pretty typical of low-cost mini PCs. It does feature a traditional hard drive with 500GB of storage space and a decently fast 7200rpm spin rate. This provides a good amount of space for applications, data and media files but if you have a lot of high definition video files, you might find that you need more space. Thankfully, HP has packed in four USB 3.0 ports, two front and two back, for use with high-speed external storage drives. It should be noted that one of these connectors will be used by the dongle for the wireless mouse and keyboard and if placed on the back, could potentially block some other USB peripherals from using the neighboring connector. It is possible to replace the hard drive within the system but it is not as easy as it is one the ASUS VivoPC. Like all miniPCs, there is no DVD drive. Just about every mini PC on the market has limited graphics performance. The same is true here with the Pavilion Small as it relies on the Intel HD Graphics that are built into the Pentium processor. This is fine for streaming video or standard graphics but it is not suited for 3D applications. The Pavilion Small does have an advantage over many other systems in that it offers both an HDMI and a DisplayPort connector. This means it would be possible to hook up the system to a 4K display but it does not really have the performance suited for 4K video streaming. As I mentioned earlier, the HP Pavilion Small 300 does come with a wireless mouse and keyboard. This is significant in two ways. First, it comes with a mouse and keyboard which Apple does not include with their Mac Mini and second, it is wireless which makes this much more suited for an environment like a home theater system as the keyboard and mouse can be used from across the room. Pricing for the HP Pavilion Mini 300-20 is much more affordable option when compared than the Apple Mac Mini. Apple's low-cost offering has a bit more performance and a sleeker design but does not come with a mouse or keyboard or offer any memory upgrade potential.